We bought a long baguette, sliced it very thin, put the slices on cookie sheets, brushed them with olive oil and baked them at 375 degrees for about 10 minutes, until they started to get brown on the edges. 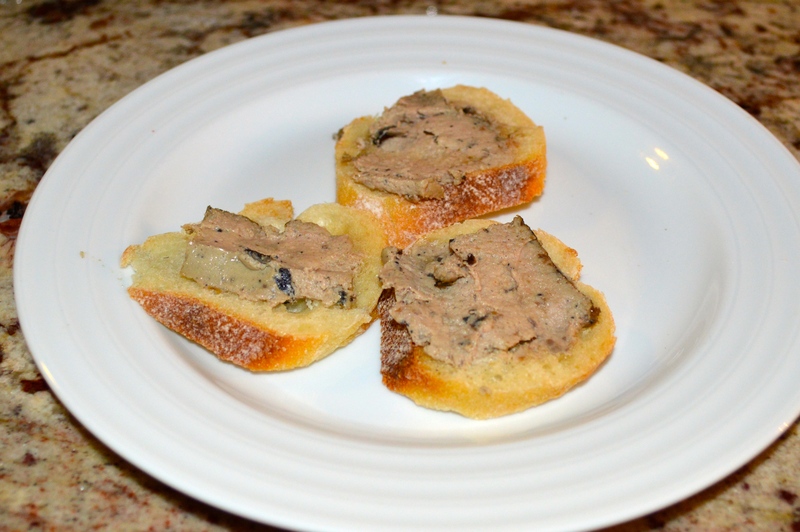 After cooling, we spread paté on top and served with, what else, champagne. This set the tone and everyone knew they were in for something good. We blanched the asparagus in boiling water for three minutes and then drained and rinsed with cold water. This was just enough to soften the spears but still leave some crunchiness. We then cut them into bite size pieces. The grapefruit is a little bit of a pain since we had to separate and peel each segment, which are then cut into two or three pieces. Joe then added a minute amount of olive oil, salt and loads of cracked pepper. He mixed it endlessly. I asked why not more olive oil or some vinegar. He sort of waved me off with a shake of the head without bothering to respond verbally. This sous-chef stuff is tough. We were sitting on the porch, drinking champagne and enjoying the paté. 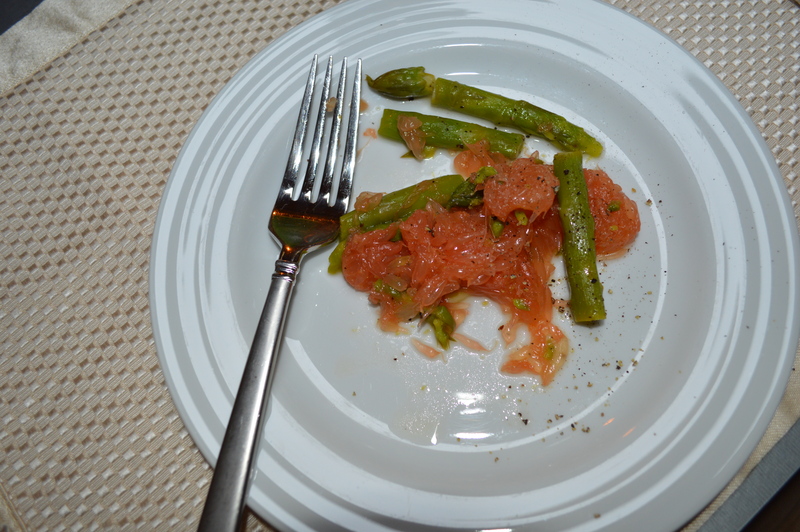 The salad was ready so I knew the next course was covered, but Joe had done nothing – zippo – nada – on the main dish. I was nervous, but as a good sous-chef, I kept my mouth shut. Then, with incredibly cool panache, Joe announced that he was going to put the fish in the oven and would be serving the salad with a lush Loire valley wine in about 10 minutes. He used some hand gesture to get me to follow behind him to the kitchen. Once in the kitchen, he turned on the oven to 375 degrees. We had purchased a three pound salmon filet at Costco, which we cut in half. My job was to pat the filets dry with paper towel and lightly season with salt and pepper. I got out the phyllo dough (sometimes called “puff pastry” and available in the freezer section of any good supermarket), and put three sheets on top of each of two cookie sheets. I had been instructed to carefully moisten the cookie sheets with water before laying on the phyllo dough. While I’m doing this, Joe has cut off the tips of two pounds of raw asparagus and has put them in the blender with a cup of crème fraîche (substitute sour cream if you have to) and some dill. A quick mix and it was ready to go! He had also neatly trimmed all of the beheaded asparagus spears to the same length. 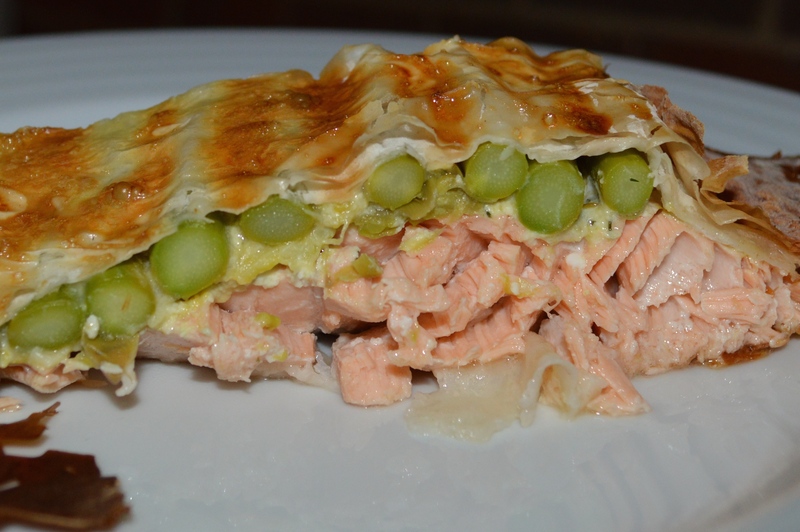 To assemble everything, we put the salmon on top of the phyllo dough, slathered the top with the crème fraîche sauce, and then put a “roof” of asparagus spears over the top. Add three more sheets of phyllo, pinch the edges together, brush with egg wash (which is nothing more that an egg beaten with a teaspoon of water), and we were done. All of this took the 10 minutes that Joe had predicted. 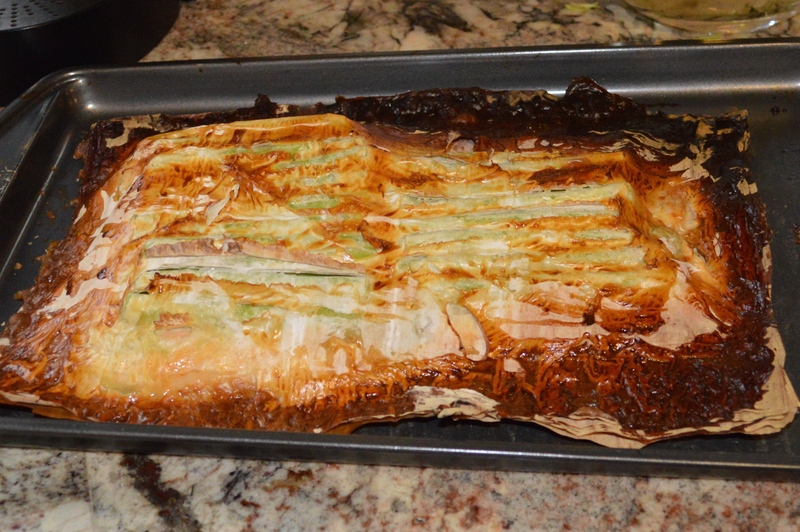 He put the pastry packets in the oven (20 minutes) and motioned me to serve the salad. Again, I didn’t really get much verbal communication – just hand and head motions. He was really playing the role. When it was finished, it was breath-taking. The fish had a wonderful sauce and a perfectly browned puff pastry crust. Surprisingly, the asparagus were perfectly tender. This is an incredibly showy dish and yet quick and easy to make. 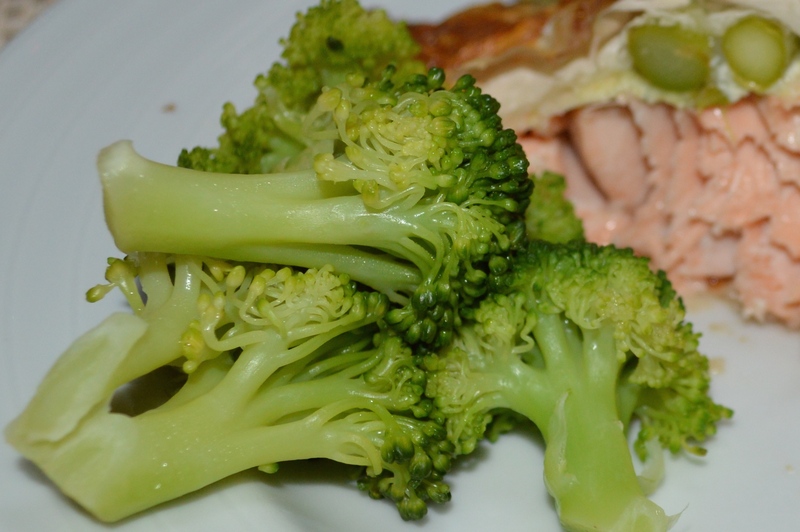 We served the salmon with broccoli. It was so gorgeous, I had to take a picture. This is a fancy name for a silly simple dessert. 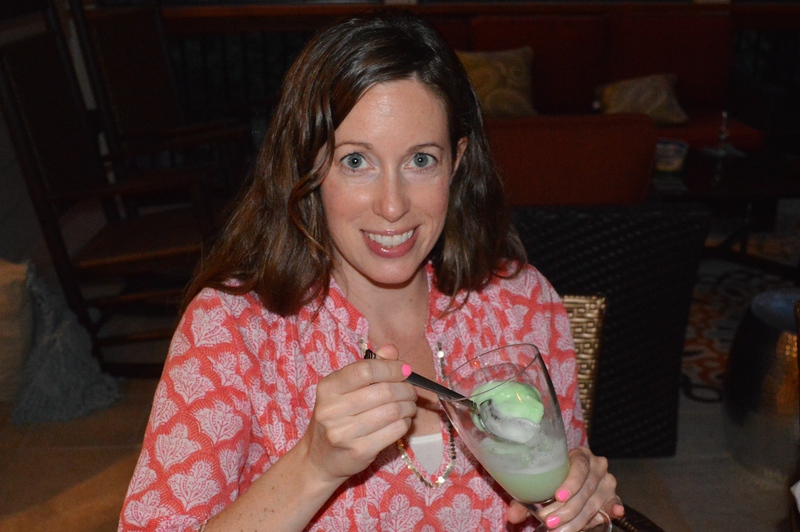 Get a good quality lime sherbet, put a scoop in a water goblet or big wine glass and pour champagne on top. 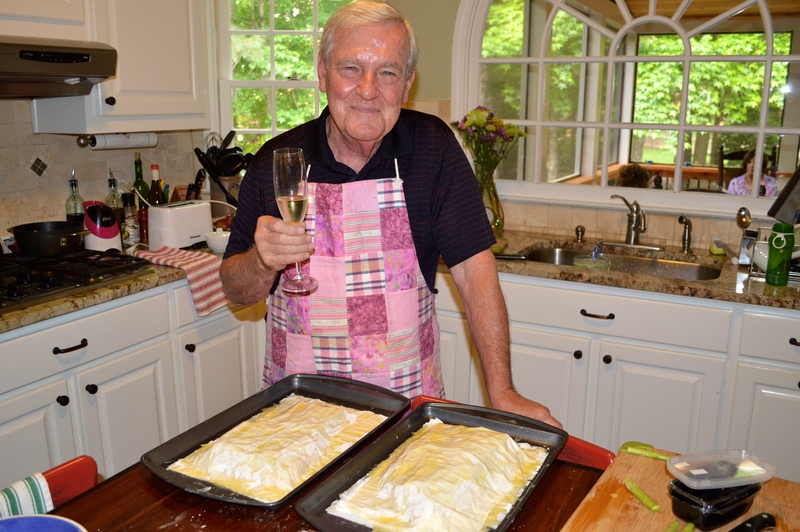 A Cook’s Brut is always available for about $10 and works just fine. What a wonderful dinner party and the sous-chef learned to make some great dishes. We need a little more interchange on our website. Send me a message and tell me about some of your Super Soirées. It sounds wonderful! Many years ago I managed to do a pretty easy filet mignon on the grill with, as I remember, onions and peppers and a side dish of spicy roasted potatoes, all of which I had found in a newspaper article, and it was wonderful. But (a) I didn’t have a sous-chef, and (b) Joe’s dinner sounds much healthier. I’ll have to try this.